The Twenty-First Judicial District Commission on Judicial Performance by a vote of 10 to 0, unanimously recommends that Judge Richard T. Gurley be retained. 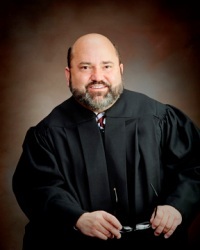 In January, 2007, Richard T. Gurley was appointed to the position of District Court Judge for the 21st Judicial District of Colorado. His educational background includes attending both Creighton University and Indiana University, where he obtained degrees in business economics and public policy. He obtained a juris doctor degree from Drake University in 1986. Judge Gurley is presently pursuing a masters degree in judicial studies from the University of Nevada/National Judicial College, which he expects to complete by May, 2017. Judge Gurley was evaluated by the following methods: attorney surveys, non-attorney surveys, self-evaluation, courtroom observations by commission members, review of written decisions, and an interview with the Commission. In the 2016 Judicial Performance Survey, Judge Gurley received a recommendation for retention from 93% of respondents completing surveys, including 97% of responding attorneys. He received higher than average ratings as compared to district court judges across the State in the following categories: case management, application and knowledge of law, communication, demeanor, and diligence. Judge Gurley is generally viewed as a very intelligent judge who gives fair and thoughtful rulings. He is known for his calm judicial demeanor and his personality is consistently recognized as being well suited to the bench. Judge Gurley is viewed as an innovator and as someone who is always looking for ways to improve himself personally as a judge, as well as the efficiency and overall functioning of his courtroom. He is lauded as a judge who views each litigant individually, and judges each case on its own merits. He schedules regular meetings with attorneys who practice in his courtroom and is open to constructive criticism. More importantly, he is willing to change courtroom procedures in response to criticism when appropriate. Judge Gurley is active in the community. He teaches three to four classes each year at Colorado Mesa University (CMU) in Business Law, the American Court System, and Trials and Legal Advocacy. He also serves as the pre-law advisor for CMU students and occasionally volunteers as a judge at high school speech and debate tournaments.